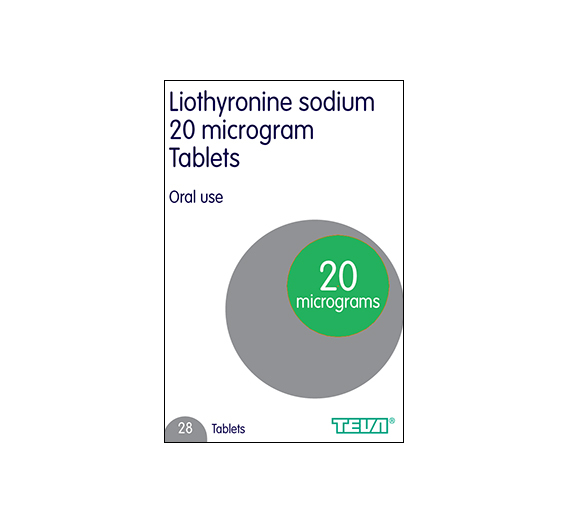 Liothyronine is a medication used in the treatment of thyroid gland problems, in particular an underactive thyroid, otherwise known as hypothyroidism. Hypothyroidism occurs when the thyroid gland does not produce enough hormones, and liothyronine aims to replace this lack of thyroid hormones or increase the levels. The thyroid gland is located in the neck and produces hormones known as triiodothyronine and thyroxine which regulate body functions, including your metabolism, heart beat, breathing, temperature and weight control. Liothyronine is important medication that keeps healthy levels of thyroid hormones, as too much or too little can cause health complications. An underactive thyroid can cause symptoms of fatigue, weight gain, sensitivity to the cold and muscles aches. People with an underactive thyroid can also develop more serious health conditions if the levels are not managed with medication, such as high cholesterol and cardiovascular disease as the body cannot convert fat into energy. Severe underactive thyroid can also cause swelling of the thyroid gland known as goitre, as well as problems in pregnancy such as pre-eclampsia. Liothyronine is prescribed in severe or acute cases of hypothyroidism where the risk of these complications are high. Please provide the name of your GP and the address of the surgery. Have you seen your GP or healthcare professional recently? Were you prescribed any medicines? If so, what medicine, strength (mg) and what dose (number of tablets per day)? Did this treatment help? Have you seen a doctor, and if so what was the outcome? Why are you ordering this medication? What is the main purpose? Have Cytomel/Liothyronine Sodium been prescribed or recommended previously? Do you suffer from asthma or any other serious allergic conditions? When did you check last time your T hormone levels? What were the levels found? Are you aware of having any malignant illness? Do you agree that you should discontinue any other thyroid replacement hormonal medication when you decide to start with Liothyronine? Do you agree to read the product leaflet before taking Liothyronine and to address us with any question you might have? Do you agree that thyroid hormones shouldn't be used in the purpose of weight loss? Do you agree to take Liothyronine as prescribed by your doctor or start with the lowest dose as initiation? Do you suffer of hypogonadism or nephrosis? Do you suffer from Diabetes mellitus, insipidus or cortical adrenal insufficiency? Liothyronine is essentially a man made way of providing the body with enough of the thyroid hormone, thyroxine, it is a synthetic form of this natural hormone. Liothyronine is a type of thyroid hormone replacement therapy. Rather than stimulating the thyroid to produce more hormones, Liothyronine acts as a fast replacement. When Liothyronine is taken orally, the effects can develop in a few hours meaning the levels of thyroxine are increased rapidly. This makes Liothyronine the first choice of medication for those who have dangerously low levels of thyroid hormones and need a fast acting replacement. Who is Liothyronine suitable for? In most cases of hypothyroidism, Liothyronine is suitable. Those who have an underactive thyroid and conditions associated with thyroid problems such as goitre and myxedema, Liothyronine is a suitable treatment, particularly when other medications such as levothyroxine have not been effective, Liothyronine is the next option. Liothyronine is suitable for those who have seriously low levels of thyroid hormones which need to be increased to a healthy level rapidly. Who is Liothyronine not suitable for? There may be instances when Liothyronine is not suitable due to a number of factors. If you are allergic to Liothyronine or any other ingredients in this medication, particularly if you are lactose intolerant you should not take Liothyronine. Liothyronine may also not be suitable to be taken in conjunction with other medications or health conditions. Diabetics should be particularly careful taking this medication. Liothyronine contains lactose (sugar) and may raise blood sugar levels, something which diabetics should be reducing or controlling. Treatments for diabetes such as insulin may also interact with Liothyronine, and therefore if you are diabetic it is wise to consult a GP to ensure that your treatment for hypothyroidism does not affect your diabetes. Likewise, other conditions such as high blood pressure and heart problems should also be assessed before taking this medication, and the medications you are taking for conditions such as these, like warfarin or cholesterol lowering tablets should also be assessed as Liothyronine may interact. Is Liothyronine suitable to take whilst pregnant? It’s important to treat an underactive thyroid during pregnancy and consult your doctor before coming off medication or starting new medication for hypothyroidism. If an underactive thyroid is left untreated it can cause complications before, during and after pregnancy. Thyroid diseases may make it difficult to get pregnant, and can cause complications during pregnancy such as pre-eclampsia, a condition which affects the second half of pregnancy causing high blood pressure and fluid retention in the ankles, feet, hands and face. You may also develop anemia and your baby may develop an underactive thyroid and problems with their physical and mental development. Hypothyroidism should be treated during pregnancy, and Liothyronine is not thought to harm the baby but you should consult a GP before taking this medication if you are pregnant. Liothyronine is taken orally every day, preferably at the same time each day to keep the hormones at a constant level. The dosage will depend on the severity of your hypothyroidism but it will usually range from 10 micrograms to 60 micrograms. Thyroid hormone replacement is usually taken for the rest of your life and it’s important not to miss a dosage and never exceed the recommended dose. Refer to your patient information leaflet or your GP for further advice on your dosage. What are the side effects of Liothyronine? This is not an exhaustive list of side effects, you may experience other symptoms which you should inform your doctor about as it may be linked to your medication. Is this an effective medication for treating hypothyroidism? Liothyronine effectively increases thyroid hormone levels so that normal body functions such as heartbeat and metabolism can be regulated normally. Liothyronine works biologically in the same way as thyroxine (the natural thyroid hormone) but develops faster in just a few hours. In acute cases of hypothyroidism, Liothyronine can significantly improve the health and wellbeing of a patient and reduce the effects of an underactive thyroid. How to buy Liothyronine online? If you’re buying liothyronine online it’s important that you do this safely and legally. Doctor-4-U makes buying this medication online safe and convenient. We have GMC registered doctors on hand to assess your suitability for this medication. Simply submit a medical consultation form and relevant details, and once you have been deemed suitable you can order your prescription medication online and it will be dispensed by our UK-based pharmacy and delivered via a tracked courier service. Initially 10–20 micrograms daily; increased to 60 micrograms daily in 2–3 divided doses, dose should be increased gradually, smaller initial doses given for the elderly.